What is less obvious is that arts and humanities are to endure the worst of this slaughter. If I am correct, it is evident that STEM subjects (Science, Technology, Engineering and mathematics) can tangibly demonstrate at least an 8-fold return on investment and so the terminally unimaginative amongst the ranks of our elders and betters will seize upon this as confirmation of their need to stem the tide of messy and pointless pursuits such as humanities and arts. The fallout from this could see an implosion of arts and humanities studies and research in HE, mass redundancies of academic staff, closures of arts departments and even of some whole universities. The impact on us as composers could be catastrophic as we take hits from both sides: massive cuts in arts funding in general which will dry up commissions and projects, and then our possibilities for earning from teaching taken away by the Government's wholesale butchery of the university sector. If anyone has any insights on how to offer a solid and convincing case for supporting and funding arts and humanities to the same extent as science, technology, engineering, mathematics and medicine, please do add your comments. It may be obvious to us that the destruction of these irreplaceable, precious resources is going to have horrendous consequences for the UK in decades to come, but it needs to be pointed out to those making the decisions now. Odaline de la Martinez has been a force in the London contemporary music scene for many years, as composer, conductor and founder of the ensemble Lontano and the recording label Lorelt. Busily preparing for the September 30th start of Lontano's Third Festival of American Music, a series of five concerts focusing on contemporary composers, Odaline stopped to talk a bit about her musical background, experience and inspiration. I was born in Cuba. My sister and I were sent to the States when we were eleven and were brought up by my aunt and uncle in Tucson, Arizona. Then my mother and brother arrived and I left for New Orleans. I studied at Tulane University and upon graduation received several awards and scholarships that brought me to the UK. I studied at the Royal Academy of Music where I founded Lontano and at University of Surrey where I did a composition MMus with Reginald Smith Brindle. My early childhood is full of memories of Afro-Cuban drumming and dancing. They have always remained. How did you start composing and conducting? I've been composing since I was a young girl. I had pieces performed in high school in Tucson. I wanted to be a conductor since I can remember, but was told (not by my family) that women didn't conduct. It wasn't until I had been with Lontano for 5 or 6 years that I started conducting. Then I studied privately with Jan Harrington, who was conducting professor at Indiana University. How did you come to settle in the UK? I was brought here by a Marshall Scholarship from the British Government. Even before I left the Academy Lontano was already recording for the BBC, something quite unusual at the time. So as it happens I stayed. Tell us something about Lontano and Lorelt. You read already a little a about how Lontano started while we were students at the RAM, etc. At the time (1976) a lot of good composers like George Crumb, Rochberg and others were completely unknown over here. I also felt that there were many other British composers that were ignored as well. So we decided to concentrate on composers that I felt were original and good. We also began to incorporate the work of many women composers and Latin Americans as well. After all I thought, "I'm a woman, Latin American and a composer. I should be paying lots of attention to them." Lorelt (Lontano Records Ltd) began in 1992 for similar reasons as Lontano. I saw really good pieces being recorded and deleted. This happened much too often. By then CDs had begun and it was no longer necessary to print thousands of LPs. You could start out with 1000 CDs and then reprint. But the point of Lorelt was never to delete a CD and to concentrate on the three categories: contemporary and living composers, women composers and Latin American classical repertoire. In 2006 when Lontano were 30 years old, we began to offer Digital Downloads on the Lorelt web site. We were also taken on worldwide by an excellent Digital Download Distributor. So we march on. Which trends and ideas interest you as a composer, and as a conductor? As a conductor I am open to all trends. I just like good pieces regardless of style. As a composer, I follow my own thing. I came to Europe and the UK looking for the Avant garde and discovered I was not an avant garde composer. Somehow a lot of my works have been written in search for Cuba. The memories of Afro-Cuban music and dancing are always there. And so they find their way into my music. What is your musical philosophy, or your musical mission? I don't have a philosophy as such. My mission: to try and do my bit to change the world by promoting music and composers that are in my opinion good and great but that have been neglected for whatever reasons. Composing happens on its own - it's not attached to any philosophy or mission. Tell us about the Festival of American Music: What are some of the Festival's themes and composer connections? Some of the themes are Latin American composers living in the States, Connections with Pierrot Lunaire - a piece that has influenced many generations of composers, and American Voices - slightly opening the door to a myriad of choral music from the States. The festival begins with an "Open Recording" on 30th September with Lontano and the BBC Singers at St. Giles Cripplegate. I have no idea. I want to finish my opera trilogy and keep recording lots of CDs - I think recording is truly the future and I try to change the world in my own little way. 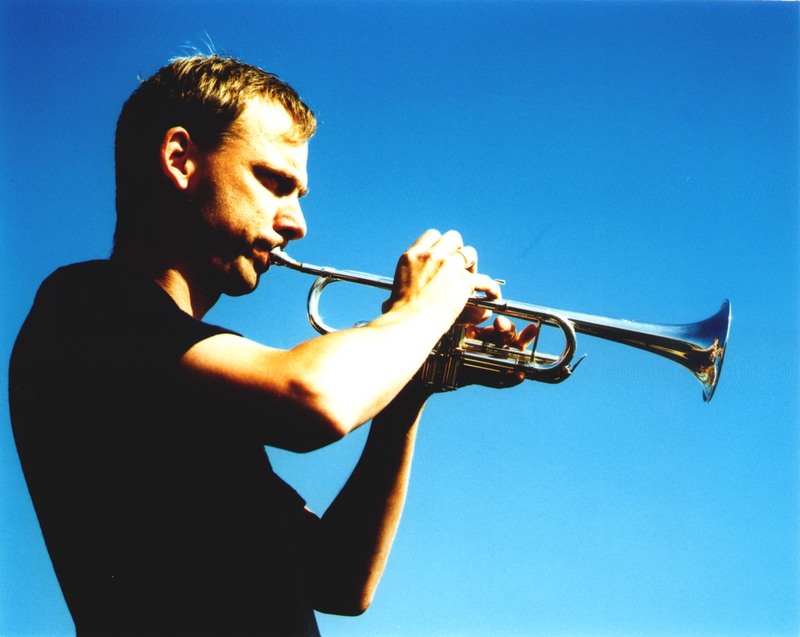 My name is Marco Blaauw, I am a Dutch trumpeter. I started my professional career in 1991, originally as an all-around trumpeter, playing musical gigs, orchestra gigs, a lot of baroque music on the natural trumpet. In the fall of 1991, I met Peter Eötvös in a project with the Asko Ensemble. From that moment on, playing his music, playing Stockhausen's music, conducted by him, I knew that I wanted to specialize on contemporary music. From that moment on, I stopped all the other activities and concentrated just on contemporary music studying with Pierre Thibaud in Paris and with Markus Stockhausen in Cologne. I worked on a lot of solo repertoire, and I started working with composers of our time and that way generated a lot of solo pieces, chamber music pieces. In 1993, I was firstly invited by musikFabrik to play with them. I played music by Birtwistle and there was a very good feeling with the group. I have been a member of the group since 1994. In 1998 we had a revolution in the musikFabrik. We as musicians had the opportunity to take the artistic leadership of the ensemble, which we started doing with a lot of passion. This democratic way of running the ensemble was a very slow learning process, but inspired most of us so much, that we started identifying with the ensemble more and more. Low-flute specialist Carla Rees has been running rarescale since 2003, championing new chamber music for alto and bass flutes. With their Premiere Series 2010 starting on Saturday 18 September at Shoreditch Church in London, I asked her to tell us more about what rarescale do, and how composers can get involved with their work. RF: rarescale has been around for a number of years, energetically championing new music by a very broad range of composers. For those readers who haven't come into contact with you, who are rarescale, and what is your mission? CR: We are a chamber music ensemble with flexible instrumentation, which specialises in music using alto and bass flute. I began working to develop repertoire for low flutes and received pieces for a wide range of chamber music combinations, so I wanted a group with flexible instrumentation which could build programmes around the works rather than developing a narrow repertoire with limited instrumentation. I am passionate about the alto and bass flute and they have a lot of potential within a solo and chamber music context, so my aim is to work with composers to develop as wide a repertoire as possible. rarescale is a registered charity, and one of our aims is to educate composers in terms of how to write successfully for these instruments, as well as doing what we can to promote their works. RF: Can you tell us more about the quarter-tone flutes you play? Who makes them, and how common are they? What draws you to them? CR: My instruments are made by Eva Kingma in the Netherlands. They have full quarter tone system key work and are capable of achieving a full range of quarter tones without compromising tone colour. They are still relatively rare instruments – the alto was made in 2000 and is the first of its kind, although there are a few others around now, and the bass was made in 2007 and is the first with an upright design, which means the weight of the instrument is taken up by the floor rather than my arms! C flutes are now being made with the quarter tone system by two different makers and are becoming a little more common. It’s a fantastic design, because the extra keys don’t get in the way of standard playing – I’d use my quarter tone instruments for Bach or Mozart, just as much as I would for contemporary music. They offer a wide range of possibilities for alternative fingerings, timbral trills and contemporary techniques (especially multiphonics) and are incredibly versatile with microtonal tunings too. On top of that, they are very well made and have a beautiful tone and response. RF: In the past, you had a remarkable open call for new works, through which you undertook to try to premiere any works with suitable scoring which were sent to you. Is the call still open, and are there any restrictions or guidelines about sending in scores? CR: The call for scores is still open. I’ve received around 600 pieces since rarescale was founded in 2003, and on average I receive one new piece a week. As a result of that, I have to be selective about what we can perform, but I learn every piece I am sent, and it goes into the database so that it can be considered for a particular performance opportunity. I tend to build programmes around instrumentation, so it can sometimes take a while before we have enough pieces to justify including a certain instrument in one of the concerts, but I programme as many of the pieces that are up to standard as I can. Generally speaking, we rarely use more than 4 (or at a push) 5 players in a concert, for financial reasons, more than anything, and it is always easiest to programme works for alto or bass flute solo or with electronics or guitar. Other core instruments are soprano, bass clarinet, cor anglais and piano, but I am willing to accept music for any combination. I prefer to receive scores as PDFs or Sibelius files by email, and I am more than happy to receive a very wide range of compositional styles – I am trying to build a repertoire for the instruments, so variety is essential. This means the works need not include the full capabilities of the quarter tone system instruments, and I will also consider works which are suitable for educational use; I run masterclass courses for alto and bass flute players so I am also always on the look out for works my students can play. RF: Saturday 18 September sees the first concert in rarescale's Premiere Series 2010. Can you tell us more about the series, and in particular Saturday's concert? What other performances and projects do you have coming up? CR: We hold the Premiere Series every year, in Shoreditch Church. We usually do two or three concerts every autumn (this year there are two) which we use as a platform for some of the new works received during the year. The first concert (on 18th) is for alto/bass flute, soprano, bass clarinet and electronics, and we’re playing a range of new pieces and second performances, including by Michael Oliva, Rob Fokkens, Scott Wilson, Thomas Simaku, Jay Batzner and Kaja Bjorntvedt. We also usually include something by a well-known composer, and this concert, Rosie Coad will be performing La Fabbrica Illuminata by Nono, which is a fantastic piece for soprano and electronics. The second concert, on 6th November, is for alto flute, guitar and electronics, and includes pieces by Claes Biehl, Elizabeth Winters and David Bennett Thomas. In place of a third concert in this year’s series, we’ll be performing the premiere of Michael Oliva’s Requiem at St Albans Abbey on 20th November, with the fantastic chamber choir, Mosaic, under Nicholas Robinson. The piece is scored for choir, organ, alto flute and electronics. Also coming up is our 2011 masterclass course on the Isle of Skye, which has both an electroacoustic composition masterclass course, led by Michael Oliva, and a composers retreat, to enable composers to come and work in an inspirational environment and to meet other composers and some of the rarescale players. Good to see some proms exposure for Israeli composer Betty Olivero, whose Neharót Neharót is being performed by the Britten Sinfonia at Cadogan hall this Saturday in a delicious sounding program including vocal group I Fagiolini. Olivero studied with Luciano Berio and I think the mixture of folk idioms and avant-garde sounds in Neharót Neharót clearly shows his influence. But she's a unique voice who deserves to be heard more.